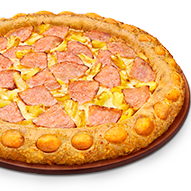 The good ol' classic Hawaiian Pizza just got a sweeter twist with the all-new sweet potato stuffed curst - filled with sweet potato mash and melted cheese, finished with parmesan cheese flakes. Your slice of simple just got sweeter. Introducing the all-new Sweet Potato Stuffed Crust – filled with sweet potato mash and melted cheese, topped with parmesan cheese flakes. 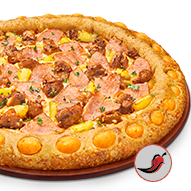 The Spicy Hawaiian is brimming with the newly improved juicy chicken chunks topping from your beloved sweet ‘n’ spicy drumlets, tender chicken ham and pineapple chunks, smothered with house buffalo sauce on a crispy and fluffy pan pizza.